I really didn't need to start a couple of new projects just yet when other things are so close to completion but I just couldn't resist. This is the progress I have made on the first dress for "Dress Me Up", a quilt displaying twelve dresses from the 1950s. With all my efforts with my improvised light box I find I have drawn a spot which wasn't even in the original. A ghost spot ! 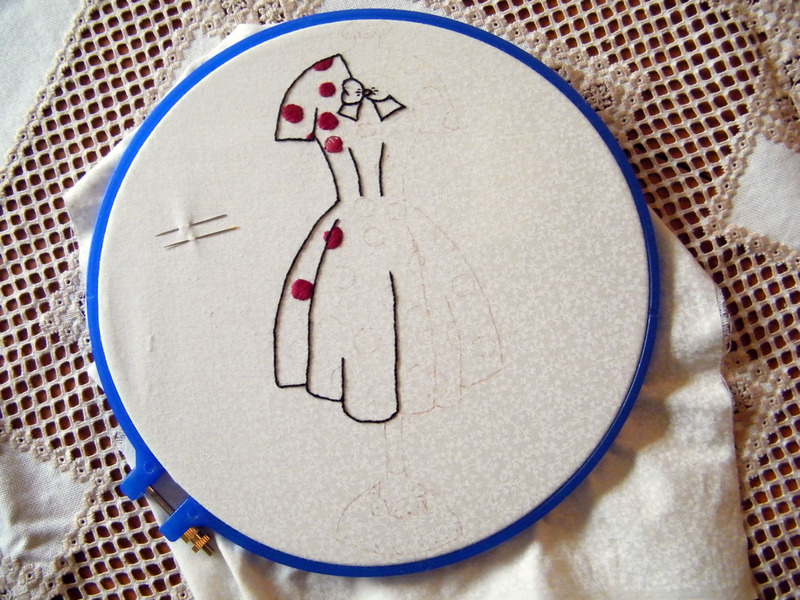 I had intended to do the spots in outline only but the black of the dress outline is so strong that I fell that all the overall patterns will need to have strength in them too, hence the solid red spots. Time consuming though. This was also a hexie flower week and the following beauties arrived from my fabric pen-pal, Brandie. Isn't the guipure lace centre attractive. It's always nice to add variety to a few of the centres. Thanks, Brandie. At the same time my offering for this month was heading in the opposite direction. I was in a much more mellow mood this month and made these very quiet hexies. I'll brighten up again next month, perhaps blues, or reds, or greens, or blacks - perhaps not blacks ! No, definitely not blacks. Spending time at home meant time to slip on a new pair of shoes so that they would soften up a bit and mould to my strange feet to make sure they were perfectly comfortable before going out in them. So what happens? I knock my needlecase onto the floor and spill some needles, and when I stand up I wonder what is the matter with my shoe. 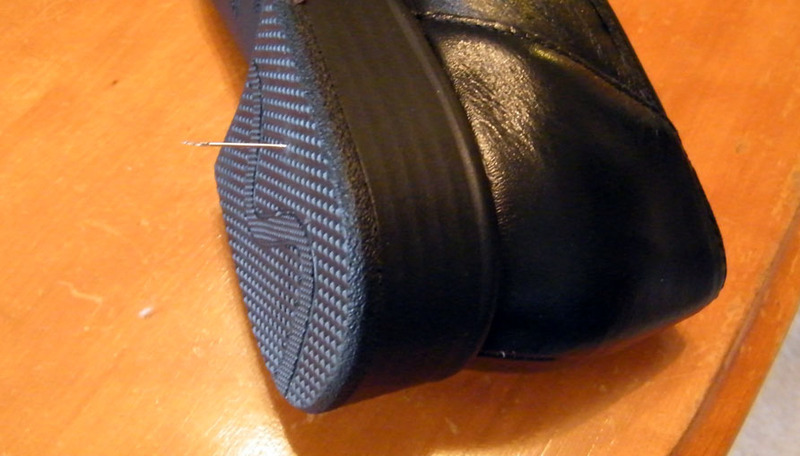 It's going to take a stronger wrist than mine to wield the pliers to get this well-embedded needle out of the shoe. Fortunately it didn't go right through to my heel. Oh ouch! That just looks scary! You're lucky that it didn't go through to your heel. 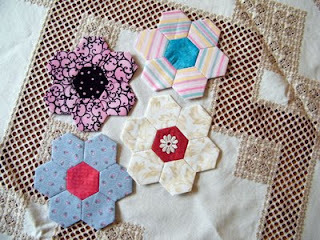 Love your hexies as always! You have to watch those pins! Luckily you had shoes on . 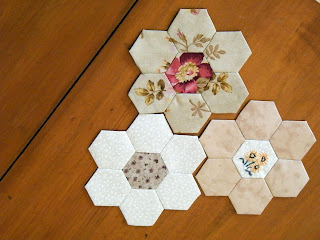 Your stitchery looks very interesting, sometimes a new project speeds up finishing other ones!